East End Congressman Lee Zeldin was at Veterans Beach on the Peconic Bay in Mattituck on March 13 to announce his support for federal funding for the Long Island Sound Program and the National Estuary Program, in the face of proposed massive federal budget cuts. President Donald Trump’s executive budget, released March 16, called for a 31 percent cut in funding to the U.S. Environmental Protection Agency. 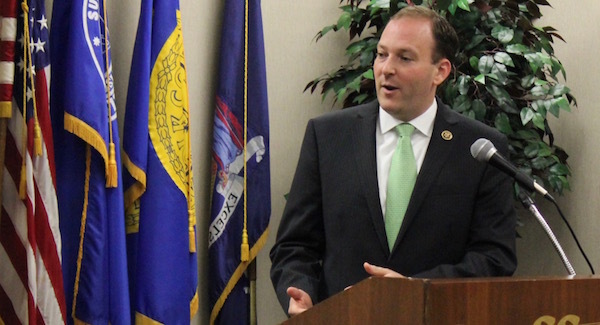 “Today, I am requesting full funding for two EPA programs essential for our local environment and at levels already approved last Congress with bipartisan support — $10 million approved by the House for the Long Island Sound Program and $26.5 million approved by the House and Senate for the National Estuary Program,” said Mr. Zeldin, who serves as co-chair of the Long Island Sound Caucus and is a founding member of the bipartisan Congressional Estuary Caucus, which was formed this February. Both the Long Island Sound and the Peconic Estuary are deemed “estuaries of national significance,” which receive funding through the National Estuaries Program. Mr. Zeldin,a Republican, said the U.S. House of Representatives passed an appropriations bill that contained $10 million for the Long Island Sound Program on a bipartisan basis last year, but the U.S. Senate did not act on the bill. “Lastly… I am advocating for bipartisan support and passage for the Long Island Sound Restoration and Stewardship Act, which would reauthorize essential water quality funding for the Long Island Sound,” said Mr. Zeldin. “The Long Island Sound Restoration and Stewardship Act would propose tens of millions of dollars in funding per year through 2020 for a water quality and shore restoration program and additional focus, oversight and coordination of federal activities related to the restoration of the Sound,” said Mr. Zeldin. Mr. Zeldin and former Congressman Steve Israel introduced the Long Island Sound Restoration & Stewardship Act in the 114th Congress and Mr. Zeldin plans to re-introduce it in this Congress, which runs through the beginning of January, 2019. Former President Barack Obama had proposed a 22 percent cut in funding for the Long Island Sound in 2015, which a bipartisan group of New York and Connecticut representatives worked to bump back up to its current level of $26.5 million. Mr. Zeldin said he plans to fight to keep funding at the current level. “Regardless of who is in the White House, the Constitution puts government funding strictly under the control of Congress through the appropriations process,” he said, adding that the President’s executive budget, which proposes major cuts to many federal programs is just a request. “Just like the bipartisan coalition that stopped President Obama’s proposed cut to the LI Sound program, I will continue to work alongside Democrats and Republicans in our region to secure this important environmental funding,” he added.